There are three key date Barber Quarters: 1896-S, 1901-S, and 1913-S. Of these, the 1901-S is by far the most difficult to locate. Mintage figures suggest it is the 1913-S that ought to be the toughest, as its production was only about half that of the 1901-S (40,000 vs. 72,664, respectively). Why, then, is the 1901-S Barber Quarter the rarest in the series? Numismatists have proposed a couple of theories: (1) the great San Francisco earthquake and fire of 1906 claimed many of its number, and (2) the introduction of coin holders in 1909 encouraged coin collectors to preserve examples of the 1913-S upon its release. Whatever the reason may be for its relative scarcity, the 1901-S is the undisputed king of the Barber Quarters, and is high on the “Want List” for many serious collectors. 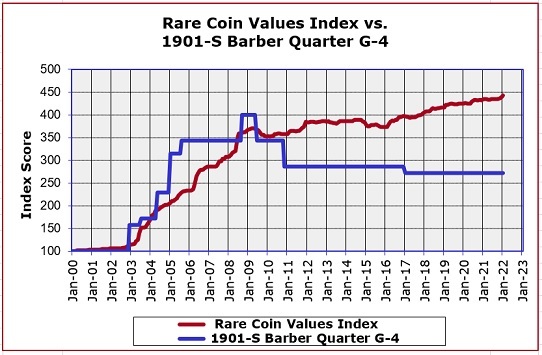 The blue line above depicts the percent value increase of the 1901-S Barber Quarter in G-4 condition since the Year 2000. The performance of the 1901-S is compared to the Rare Coin Values Index, as depicted by the red line. The Index score is based on the composite percent change since Year 2000 of a carefully selected group of 87 rare US coins. The Index score provides an understanding of the strength and direction of the overall rare US coin market. The 1901-S Barber Quarter is one of the 87 coins tracked in the Index, and as you can see, somewhat parallels the Index score. The Index is updated monthly.